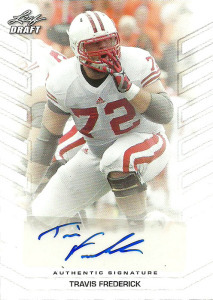 One of the better offensive linemen of the 2013 draft, Travis Frederick was a skilled mauler both at center and at guard for Wisconsin. Opting to declare early for the NFL draft, Travis was rated as the #1 center in the 2013 Draft. With a run on offensive linemen early in the draft, Frederick’s card moved up into the first round where the Dallas Cowboys carefully decided to select him with the second to the last pick of round 1. Roundly criticized initially for the pick, with more glaring needs on the board, the Cowboys actually made the safest and strongest pick they could by reinforcing the offensive line that was protecting quarterback Tony Romo. Frederick has anchored the center position since his rookie year, unseating veteran Phil Costa. (It was a milestone as he was the first Cowboys rookie center to do so.) In 2014 Frederick was named to the ProBowl after leading an exceptional line that paved the way for runningback DeMarco Murray to challenge the single season NFL rushing record. Although the Cowboys fortunes sunk early on after a promising start in 2015, Fredrick garnered his second consecutive 2nd Team All-Pro nomination.